Militants 60 times shelled army positions in Donbas. Over the past day, militants 60 times fired at the positions of Ukrainian army in the area of the anti-terrorist operation in Donbas, killing three and wounded nine Ukrainian troops, the ATO press center reported in Facebook on Tuesday, 21 March. In the Mariupol sector, the militants attacked the positions of Ukrainian marines in the area of the village Vodyane. Having received a rebuff, the terrorists used Grads and 152- and 122-mm artillery. The enemy's heavy artillery systems pounded the positions of marines in the areas of Lebedynske and Talakivka. 120-mm and 82-mm mortars shelled Shyrokyne, Mykolaivka, Novotroyitske and Krasnohorivka. Militants used small arms, heavy machine guns and grenade launchers of various systems to pound Shyrokyne, Vodyane, Novotroyitske and Hnutove. In Shyrokyne, Russia-backed terrorist forces attacked marines with the weapons of armored vehicles and tanks. 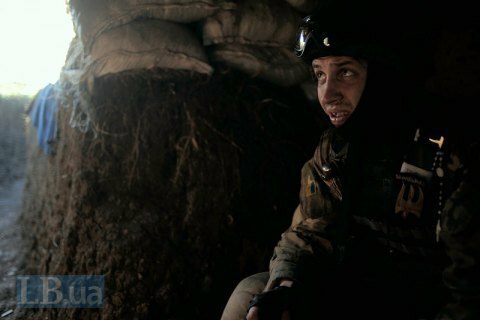 In the Donetsk sector, the ATO forces in the areas of Butivka coalmine, Luhanske and Kamyanka were under enemy mortar fire. Militants shelled Ukrainian positions in the area of Avdiyivka with machine guns, grenade launchers, mortars, and a tank. In the Luhansk sector, the terrorists shelled the positions of the Ukrainian military near Troyitske, Novozvanivka and Novooleksandrivka with grenade launchers, heavy machine guns and small arms. Ukrainian defenders in the area of Tryokhizbenka were struck with anti-tank guided missiles. On Monday, March 20, eight enemy mercenaries were killed and 16 more wounded in combat in the area of Vodyane.